Blue velvet over boards, with arms of Jean Coeur and with studs shaped like hearts and coquilles in bronze, front and back, bronze clasps; in full crimson morocco bookform folding case, lined with swan's down, plain finish, by Sangorski & Sutcliffe, London, 1959. Jean Cœur, archbishop of Bourges; his arms (azure, three hearts gules, on a fesse or three escallops argent) and motto (morir covient sovent advient et nen sovient) on numerous pages throughout manuscript; Coeur, Harlay, Courtenay, and Bauffremont families; Marquise de la Chataigneraie; Lucien Gougy; his sale, Paris, Hôtel Drouot, Mar. 5, 1934, lot 13; Paul Chenu, purchased in Jan. 1958 from Arthur Rau, Paris, for William S. Glazier (1907-1962), New York; deposited in the Pierpont Morgan Library by the Trustees of the William S. Glazier Collection in 1963. 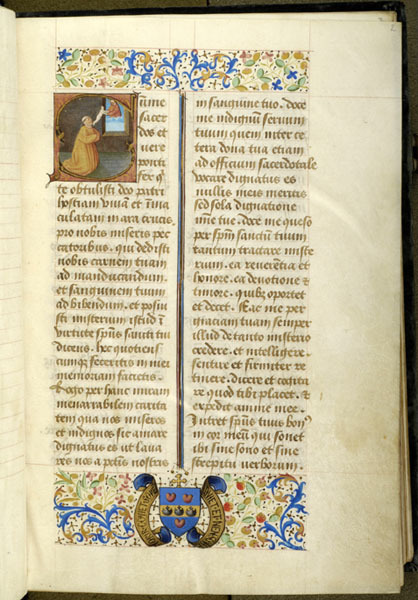 Ms. pontifical matutinale and missal for the use of Bourges; written and illuminated in Bourges, France, ca. 1460-1465. Decoration: 23 historiated initials, many decorated initials, line endings; some borders top and bottom; arms of Jean Coeur, archbishop of Bourges, on numerous pages (azure, three hearts gules, on a fesse of three escallops argent) and motto: Morir covient sovent advient et nen sovient. Artist: Jean Colombe (historiated initials only).